You've heard the old sayings: 'Love makes the world go round'; 'We may not have it all together, but together we have it all'; 'I love you more today than yesterday... yesterday you really pissed me off.' Wouldn't those be perfect decorative wall plaques for someone you love? There's virtually no end to the sentimental, touching and cute love sayings you'll find on the decorative wall plaques at Mountaine Meadows. 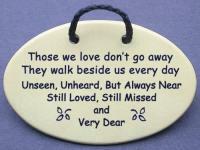 Looking for sentimental gifts that show your loved ones how much you care? 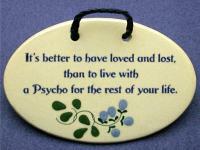 Send one of our inspirational sayings on a ceramic wall plaque. These handmade wall plaques are the perfect gift for Mom or Dad... they make unique anniversary gifts, too! Imagine the expressions of delight on your loved ones' faces... the sentimental cooing... (even the gleeful laughter) when they unwrap decorative wall plaques from Mountaine Meadows Pottery. Browse our selection of decorative wall plaques - all handmade in Vermont - to find just the right one for your special someone. We've got dozens of categories to choose from. Special folks in your life deserve a reminder of your love - it's a sentimental gift straight from your heart. And remember, when you buy three decorative wall plaques from Mountaine Meadows Pottery, you get your fourth plaque free.